The colors of our womens sandals draw on fresh summer trends. Black, white, blue, gold Whatever you choose, this pair of toe flat sandals will become the best compliment to all of your looks. A quiet minimalist design lets you enjoy those warm days in the summer to their full effect. Sport an easy tropical vibe with these open toe flat sandals. A special detail of the sandals is their comfortable double strap and stitched sole. It emphasizes the clean, muted look of the shoe. The soft and comfortable footbed provides extra comfort. These lightweight sandals compliment any casual outings to the office. 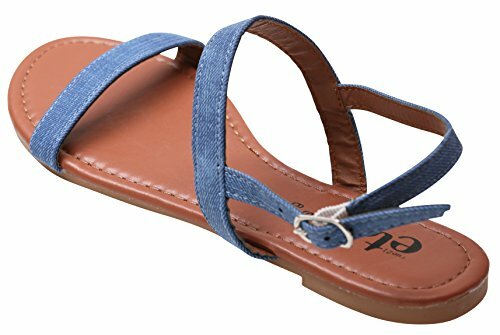 Ideal for the morning casual wear, they easily match your denim, shorts or skirts, while they take your dressy night looks to a whole new trendy level. Easily slip your feet in and out our summer sandals. The smooth surface simply glides across your feet. It's easy to forget you even have them on. The substantial lugged cushion sole ensure easy carefree walking. Wear them knowing you'll enjoy all-day comfort. When we were on vacation, on the beach, in the city or in an office - everyone will admire your sandals. Our footwork is high quality, comfortable and extremely stylish. 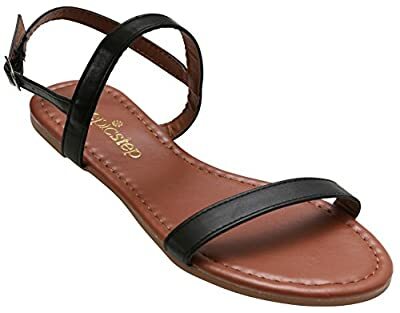 COMFORTABLE WOMENS SANDALS - Look no further for affordable yet comfortable shoes for women. Our sandals come in a wide variety of colors for all occasions. These strappy sandals will compliment your elegant feet. Show off your pedicure to its best effect. A quiet minimalist design lets you enjoy those warm days in the summer to their full effect. Sport an easy tropical vibe with these open toe flat sandals. They're the next best thing to going barefoot. EXCELLENT QUALITY - Our superior quality women sandals are true to fit. The double straps are snug without slipping. The quality of our shoes for ladies are unmeasured down to the stitching in the sole. The sole and double straps hugs your foot. 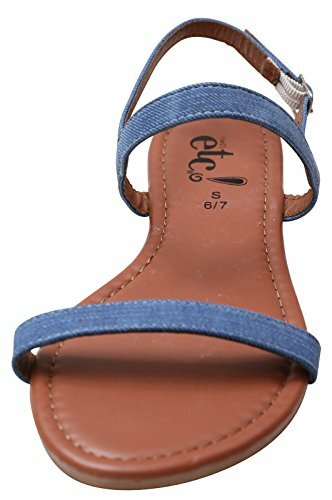 These open toe double strap flat sandals for women are made for walking... and looking cute! Enjoy the convenience of our shoes everywhere including comfort at work, school, after a party or in a mall. We designed these sandals to be LIGHTWEIGHT! OPEN TOE FLAT SANDALS - Easily slip your feet in and out our summer sandals. The smooth surface simply glides across your feet. It's easy to forget you even have them on. The substantial lugged cushion sole ensure easy carefree walking. Wear them knowing you'll enjoy all-day comfort. When we were on vacation, on the beach, in the city or in an office - everyone will admire your sandals. Our footwork is high quality, comfortable and extremely stylish. COMPLIMENTS ANY OUTFIT - Available in different colors. These summer open toe flat sandals match any outfit! Pick one and feel the unmatched style that will take your style to new heights! Select your color choice of Black, Blue, and White. These shoes for ladies can be worn all day long. The sandals will match any casual or formal wear. 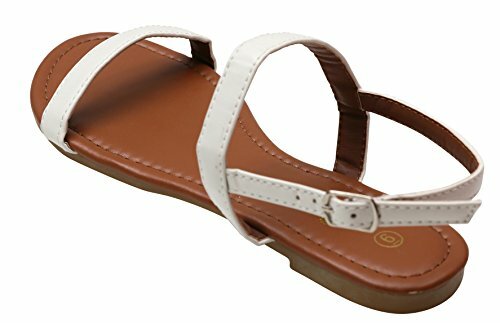 These ladies sandals are so comfortable, you will forget you are wearing them on your feet! 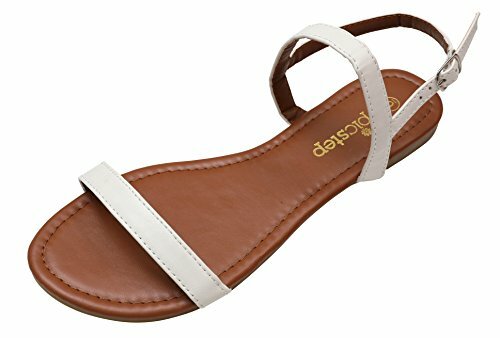 DURABLE LADIES SHOES - Our double strap sandals were made with longevity and durability as top priority. The quality upper textile and the sturdy rubber sole insure long, heavy wear. Put them on and set off shopping, hiking or on your daily out and about;Very dressy and very causal. they will be with you for a long, long time!